Wing span: 1 - 1 11/16 inches (2.5 - 4.3 cm). Identification: Wings are rounded. 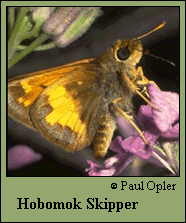 Upperside of male is yellow-orange with irregular black borders and no stigma; underside of hindwing has purple-gray on the inner margin. Female has 2 forms: Upperside of normal form is duller and has less orange than the male; underside of hindwing is orange with purple-gray at the inner margin. Upperside of "pocahontas" form is purple-black with some dull white spots on the forewing; underside is purple-black with the pattern obscured. Life history: To await receptive females, males perch about 6 feet above ground on vegetation in woodland clearings. Females deposit eggs singly on or near the host grass leaves, which are eaten by the caterpillars. Caterpillar hosts: Various grasses including panic grasses (Panicum) and bluegrasses (Poa). Adult food: Nectar from flowers including common milkweed, henbit, viper's bugloss, and blackberry. Habitat: Openings and edges of damp woods, edges of bogs, light gaps along streams, city parks. Range: Nova Scotia west across southern Canada to central Alberta; south to New Jersey, northern Georgia, Arkansas, central Kansas, and eastern Oklahoma. An isolated population ranges from central Colorado to northern New Mexico.